When people ask me where do I get my passion for cooking, and not forgetting to mention my mum or she will get mad, I will have to say that I am from a real gastronomic paradise called LOGROÑO, the city where I grew up and where every time I visit I am surprised with a new, amazing bar/tapa/pincho added to the more traditional ones. Mini Kobe beef burgers from the bar Torres in the calle San Juan are a real treat!!! 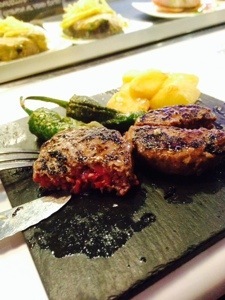 This entry was posted in food and tagged beef, burger, cooking, food, larioja, logroño, world. Bookmark the permalink.